San Antonio, TX. The full spirit of the Queen Anne style is displayed here, with its picturesque (irregular) floor plan, and a jumbling of numerous other styles including romanesque and neoclassical. PERIOD OF POPULARITY: 1880’s – 1900 (1905 in the West). 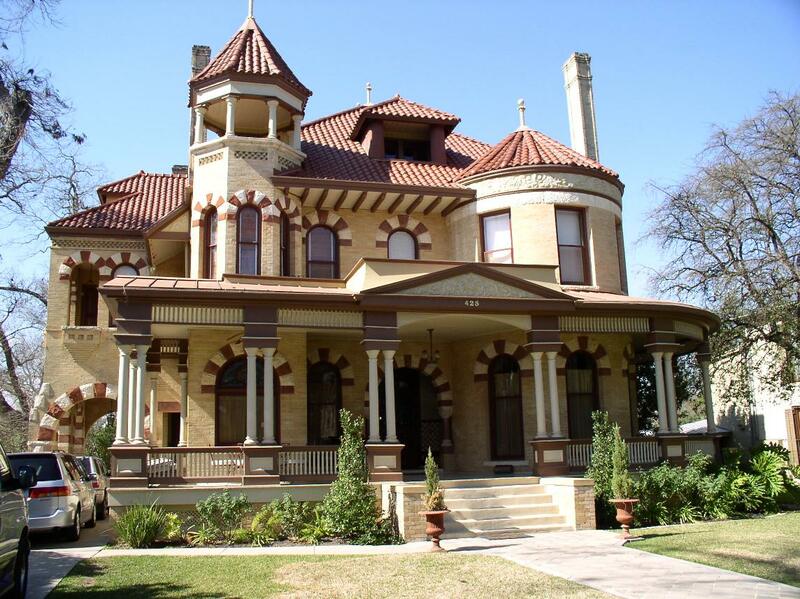 IDENTIFYING FEATURES: Steeply pitched, irregular roof shapes; dominant, front-facing gable; patterned shingles, bay windows, picturesque massing (see Gothic Revival), polychromatic and decorative ornamentation; partial or full-width porches of one story; multiple gables and dormers; occasional towers and turrets, rounded or square. Differing wall textures are their “hallmark”. This is the most eclectic style of the Victorian era. BACKGROUND AND INSPIRATION: The Queen Anne style represented the culmination of the picturesque, or romantic movement of the 19th century. Based on a premise of “decorative excess” and variety, there was little attempt to stay true to any one particular style or historical detailing. Rather, the style displayed a combination of various forms and stylistic features borrowed from the earlier parts of the Victorian and Romantic eras. The name of style suggested eclecticism (variety) to its proponents in England, from where the style originated. Still, “Queen Anne” is somewhat misleading given her much earlier reign (1702-1714) during times when Renaissance-inspired architecture was the norm. Richard Norman Shaw was the most prominent architect in England to promote the Queen Anne style, inspired as it was by a mix of earlier Tudor, pre-Georigan, and late medieval styles. 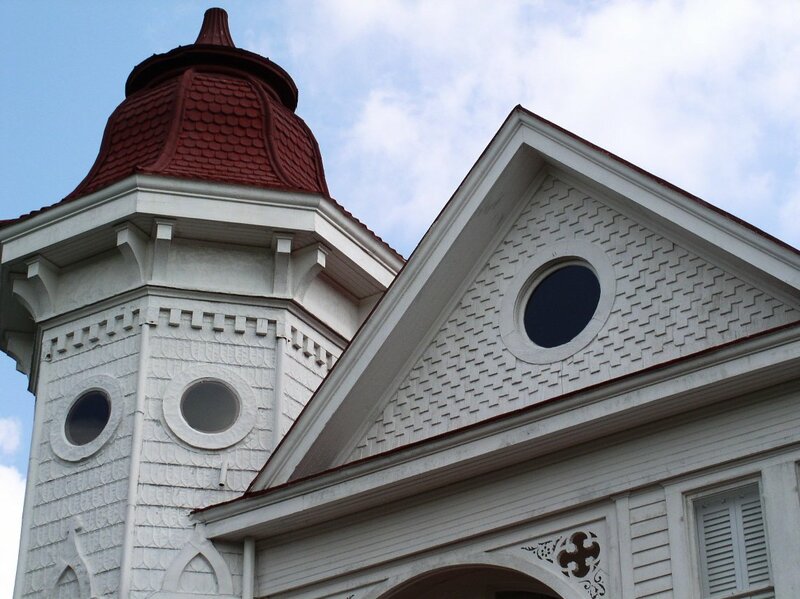 In America, the style was most commonly employed for houses and much less common for commercial structures. One occasionally sees a dominating brick or stone structure on Main Street that displays elaborate Queen Anne features, though this was not the style that defined American main-street commercial districts. Instead, the last two decades of the nineteenth century saw Queen Anne become the most dominant residential style in the U.S., heavily favored by the Victorian elite who had become wealthy from industrial growth. Middle- and working-class families often enjoyed their own versions, however, in the form of smaller, L-shaped cottages or other “folk” variants decorated with some of the style’s typical trim or siding varieties (see Folk Victorian page). The style may include design elements of Charles Eastlake, who influenced interior and exterior styling with his 1871 American version of Hints on Household Taste in Furniture, Upholstery, and Other Details (1868). 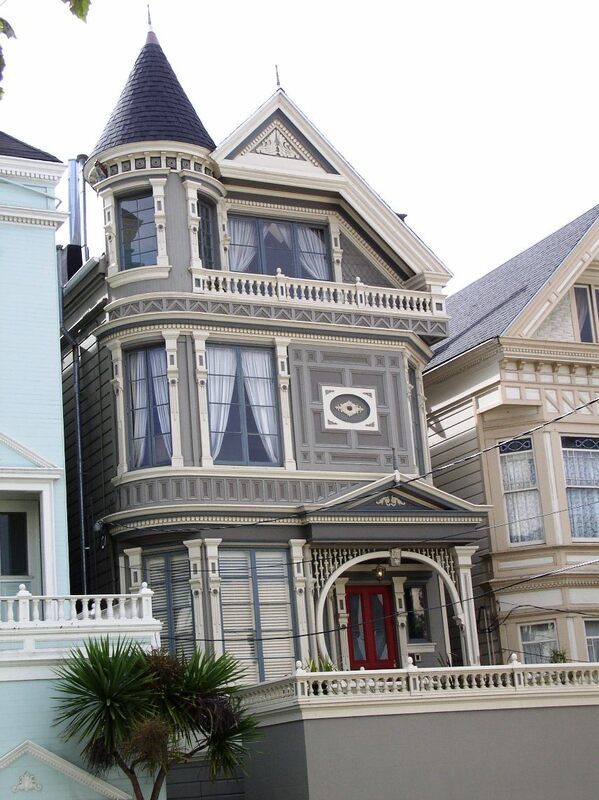 The extent to which home builders applied his wood-crafted designs, however, appalled him during the late Victorian period, as he had not intended his designs to be used to such excess. Variations on Queen Anne, considered predecesors as well, included Stick Style, which represented a transition from the Gothic Revival to the later Queen Anne style. On stick-style buildings, the wall surface itself is emphasized with ornament, identified most prominently with the diagonal or straight stickwork applied to the facade. 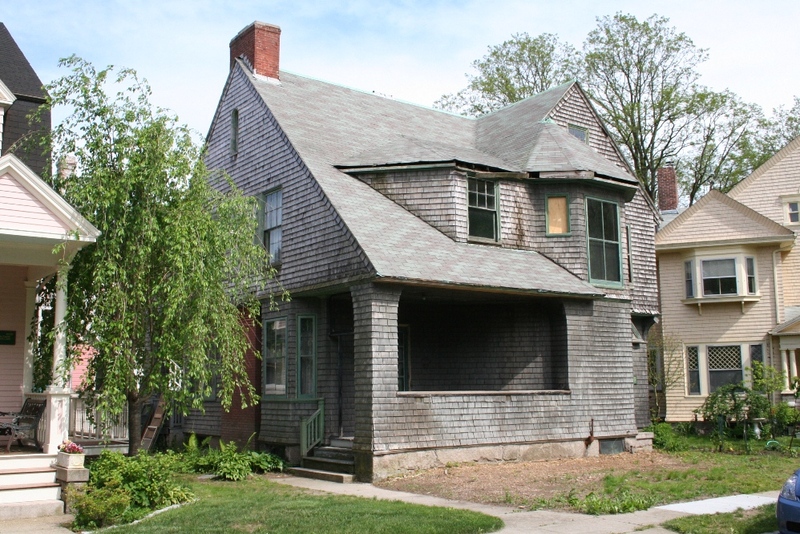 In contrast, the Shingle Style was a regional variation that emerged in New England, named for its prominent use of wooden, stained shingles (often cedar). Although more subdued and conservatively decorated than their Queen Anne contemporaries, Shingle Style homes typically employed similar picturesque (irregular) massing and floor plans and included a variety of late Victorian features. 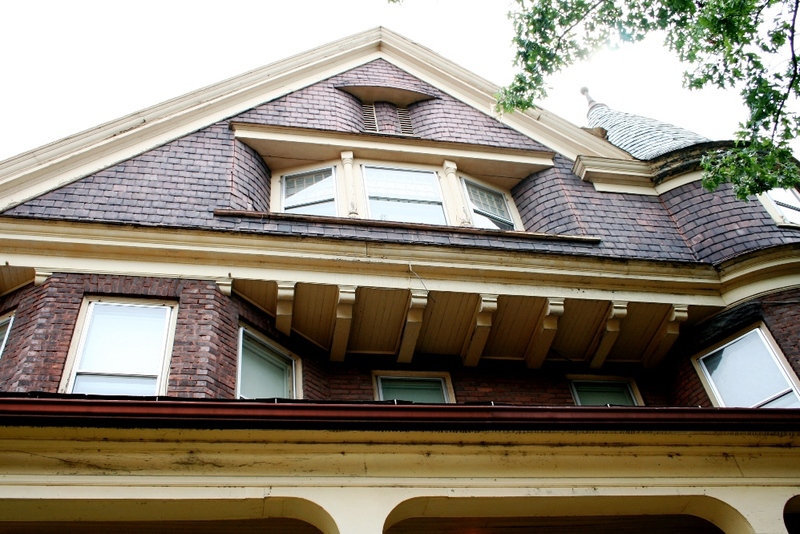 For More Photos of Queen Anne, Stick, and Shingle Styles, Click Here. Oak Park, IL. 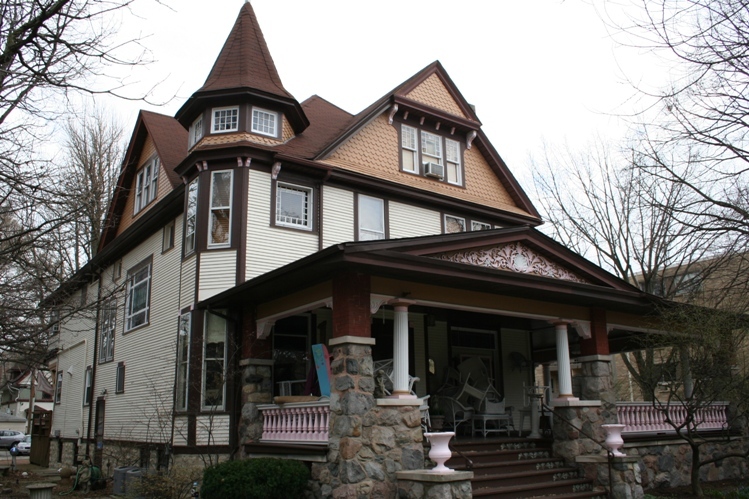 A cross-gable, asymmetrical floor plan, corner turret, diverse siding materials and window shapes, and some early craftsman or prairie-style features make this a Queen Anne home. 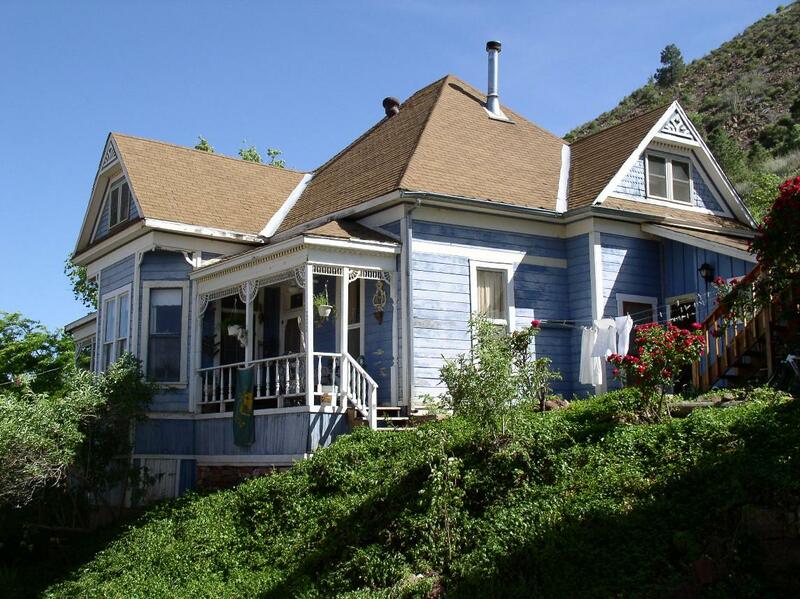 Jerome, AZ. A typical Queen Anne home in the American West, including a cross-gabled plan, cantilevered gable over bay window (left side), and decorative spindlework and vergeboard. 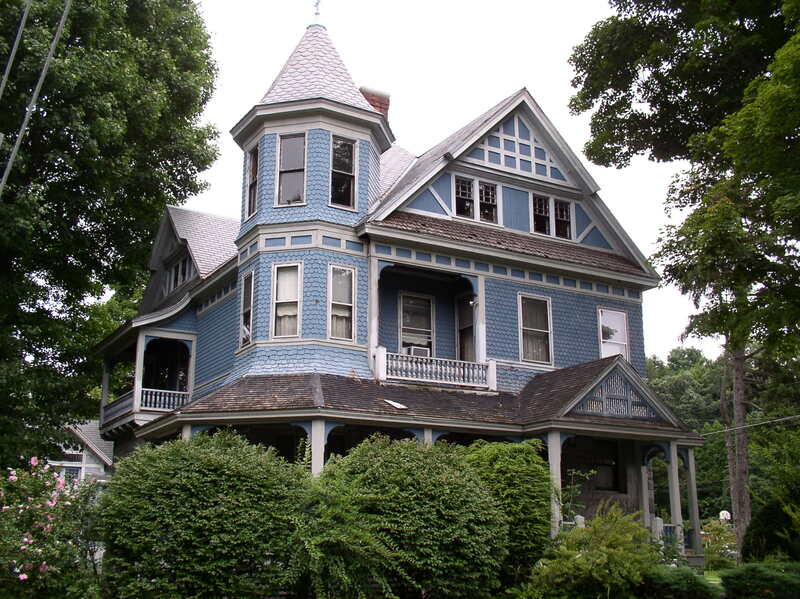 Wilkes-Barre, PA. A shingle-style gable with inset bay window and corner turret on the right. Savannah, GA. Three prominent features of Queen Anne style: fish-scale (scalloped) shingles in the gable, rounded tower or turret, and a less common ogee-shaped (S-shaped) roof. New Bedford, MA. A modest shingle-style home under renovation. Stafford Springs, CT. 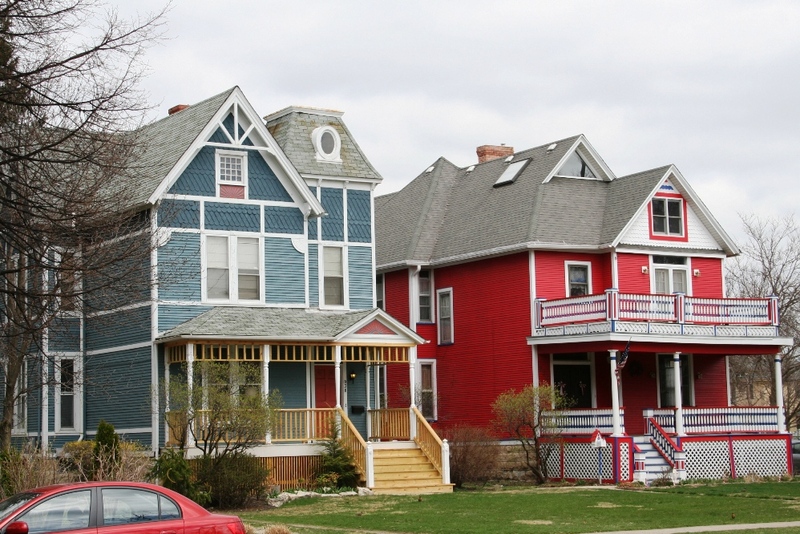 Many typical Queen Anne features are seen here, including fish-scale siding, single-paned sash windows common by the late 1800's, stick-style gables, rounded tower or turret, and wrap-around porch. Oak Park, IL. A pair of Queen Anne homes in a wealthy Chicago suburb, with Stick Style features on the left home. San Francisco, CA. It was challenging but not impossible to construct Queen Anne homes on small urban lots like this one.